One of the options you have for your hardwood floors is wide plank flooring. There is a reason hardwood flooring is one of the most widely used flooring options on the market. It’s warm, classic feel and low maintenance needs make it perfect for many, many homes. One of the options you have for your hardwood floors is wide plank flooring. Wide plank flooring is just as diverse as other hardwood options, it just looks a little different. It’s all about what you want to see in your home! Here are just a couple of the benefits of wide plank flooring. Wide plank flooring is defined as hardwood flooring that is wider than about 3 inches. This is an incredibly broad definition, so pretty much every variety of hardwood flooring is available in a wide plank option. Wide plank flooring is available in a wide variety of wood species, colors, finishes, and compositions. 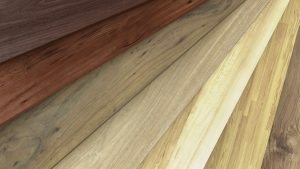 Since wide plank flooring is available in such a wide variety of options, it also comes at a wide variety of price points. It is easy to find a wide plank flooring option for almost any budget. Whether you’re doing a relatively small project and want to splurge on flooring or you need to re-do the flooring in several rooms of your home, you can find a wide plank flooring option that fits your design preferences and budgetary needs. Since wide plank flooring is wider and therefore takes up more surface area than narrower alternatives, the installation tends to take far less time. If you’re pressed for time, wide plank hardwood is the way to go. The faster the installation, the sooner you can get to enjoying your beautiful new hardwood floor! Nothing beats the classic look and feel of hardwood flooring. Since wide plank flooring uses larger slices of wood, you get to see even more of the natural patterns in the wood grain. These elements add character to any room and make a beautiful conversation piece. This entry was posted on Wednesday, October 18th, 2017 at 1:44 pm. Both comments and pings are currently closed.